This peach cobbler recipe has a top crust, you can make flat-top one, or a lattice if you're feeling fancy. Our other peach cobbler is Grandma's Peach Cobbler. Combine the peaches, sugar, flour, cinnamon and nutmeg in a Dutch oven. Allow to set until sugar is dissolved and a syrup forms. Over medium heat, bring the peach mixture to a boil, then reduce heat to low and cook until tender, about 10 minutes. Remove from heat and stir in melted butter. Set aside and keep warm. Lightly butter an 8- or 9-inch square Pyrex or other baking dish. Roll out half the pastry as for a pie, but cut it to fit the bottom of your baking dish. Spoon half the peach mixture into the baking dish and cover with the pastry square. Bake for 12 to 14 minutes, or until lightly browned. Remove from oven and spoon remaining peach mixture over the baked pastry. Roll out the remaining pastry, and cut into strips about an inch wide. Arrange strips in a loose lattice weave over the peach mixture. Sprinkle lightly with granulated sugar, if desired. (See Note below about alternative pastry top.) Bake an additional 15 to 20 minutes or until nicely browned. Note: Here's an easy way to peel peaches: Make a small slit at the stem end of each peach. Then drop them into a pot of rapidly boiling water for one to two minutes (about 1-1/2 minutes is right for medium-size peaches). Remove the peaches with a slotted spoon and put them directly into a container of very cold water. After a few minutes, you can begin peeling, and the skins will easily peel off. Use the slit you made at the stem end as a starting point. Since this recipe calls for eight peaches, you might do two at a time. 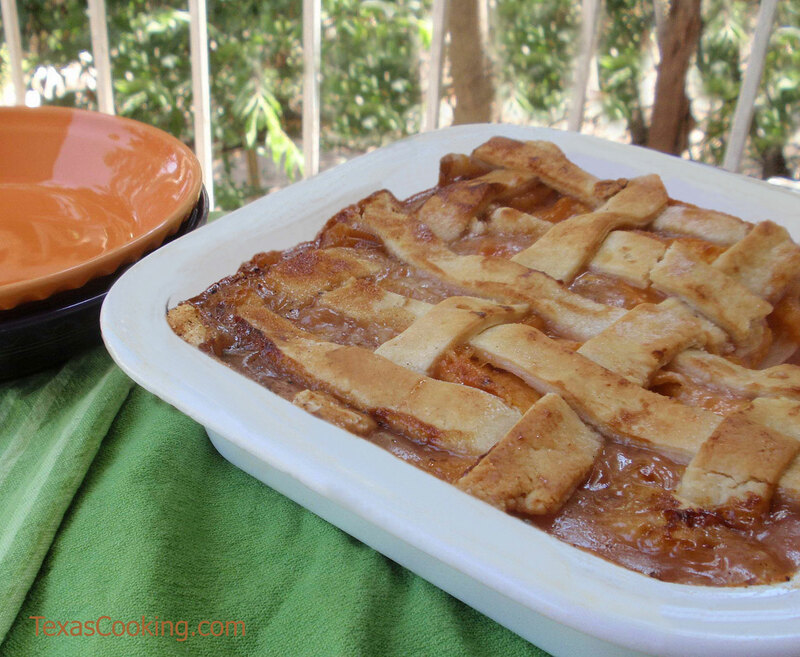 There is no law saying that peach cobbler must have a lattice crust. You may roll out another pastry square for the top. Be sure to sprinkle it with a little sugar and brown it nicely. It will not look quite so fancy, but it'll taste just as good. One final thought: If you yearn for peach cobbler and good peaches are out of season or otherwise not available, use frozen peaches. Canned peaches, however, are not recommended.